Associated Press photographers were there to record a world in constant motion in 2018. Some of it was huge, and destructive. But the AP was also there when the world stopped, at least for a moment. See photos. 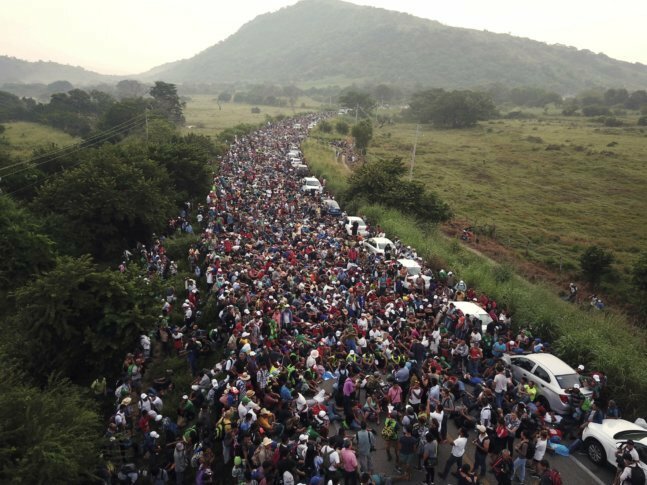 A human tide of would-be Americans, rolling toward the border. American rockets streaking across the darkness over Damascus. Students fleeing a gunman at a Florida high school, their hands raised in the air. Associated Press photographers were there to record a world in constant motion in 2018. Some of it was huge, and destructive — lava pouring from a Filipino volcano, the leveling of Indonesian neighborhoods by an earthquake, the wildfires that raced across California. Some of it was human scaled, but no less epic — disgraced comedian Bill Cosby being led in handcuffs from a Pennsylvania correctional facility; an angry crowd carrying a wounded youth during clashes with Israeli troops in Gaza. But the AP was also there when the world stopped, at least for a moment. President Donald Trump’s hands grasp instructions on what to say to participants at a meeting on school shootings (“I hear you”). Dressed entirely in red, the Queen of Soul rests in her coffin. And girls weep in the aftermath of the rampage at a Pittsburgh synagogue that left 11 dead and countless hearts broken.